United States Secretary of State Hillary Clinton was in Geneva for a short visit this week. The presence of the U.S. Secretary of State anywhere in the world is a major event. Those who complained about security measures at the United Nations Office and inconveniences in its neighborhood should be reminded of the power and importance of such events. Like it or not, Mrs. Clinton represents the world's major power - whatever that means - and is an important actor in her own right. Imagine the level of excitement if President Obama came to Geneva! Mrs. Clinton "dropped by" Geneva in the midst of a whirlwind European tour, graphically described in the December 7 Tribune de Genève. Since Mr. Obama has begun to hit the campaign trail, it is left to the Secretary of State to represent American presence overseas. 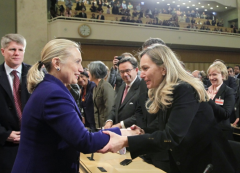 From a meeting in Bonn on Afghanistan to an OSCE ministerial in Vilnius where the future candidacy of Switzerland for the Chairmanship in Office in 2014 was high on the agenda to Brussels and NATO, Mrs. Clinton spent a dizzying five days in Europe. Her agenda in Geneva for her short visit was also dizzying in intensity. The expression "drop by" is sometimes used when one has three or four invitations for the same evening and manages to spend a short time at each. In Geneva, Mrs. Clinton was able to address the UN Human Rights Council, the United Nations High Commissioner for Refugees Ministerial meeting on the 60th Anniversary of the Refugee Convention, the Review Conference of the Biological and Toxin Weapons Convention as well as meeting with Syrian opposition groups. And that was her official agenda. Geneva is often called the Rome of Multilateralism. A visit by the U.S. Secretary of State is a symbol of American renewed interest in multilateralism. The fact that Mrs. Clinton addressed the Human Rights Council is also a positive symbolic gesture of America's return to the organization, something not at all evident in the current political atmosphere in the U.S.
Having said that, a "drop by" is still a "drop by" and hosts can always say to invitees that we know your busy schedule and commitments, but we had hoped that you could have been with us a little longer so that other subjects could have been discussed, such as the recently revised Geneva Initiative 2.0 for Israel and Palestine or continuing American pressure on Swiss banks, two issues particularly important for Geneva. One should be thankful for a visit by a U.S. Secretary of State in any circumstance, but, unfortunately, a "drop by" is still just a "drop by".